The Vodyanoi on an early 20th-century Russian postcard. 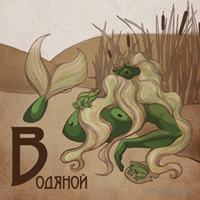 The Vodyanoi (водяно́й in Russian) is a water-dwelling demonic creature of Eastern Europe. His appearance can be described as somewhere between that of an elderly man and a toad, with a greenish beard and dripping with muck and weeds. He is a curmudgeonly old spirit whose time outside of his lavish underwater home is often divided between murder and mayhem. Vodyanoy by the great Russian skazka illustrator Ivan Bilibin, 1934. As with other demons such as the Croucher, the Vodyanoi may be descended from seraphim who were cast down from Heaven by the archangel Michael—in the case of the Vodyanoi, into rivers, lakes and ponds. Found most commonly in the post-Soviet states and the Balkans, the Vodyanoi makes his home in an oddly opulent mansion at the bottom of a freshwater millpond, rarely venturing far from his home waters. In fact the Vodyanoi may never leave the water except to float about on a soggy log, as it is said that he has the tail of a fish like a merman. 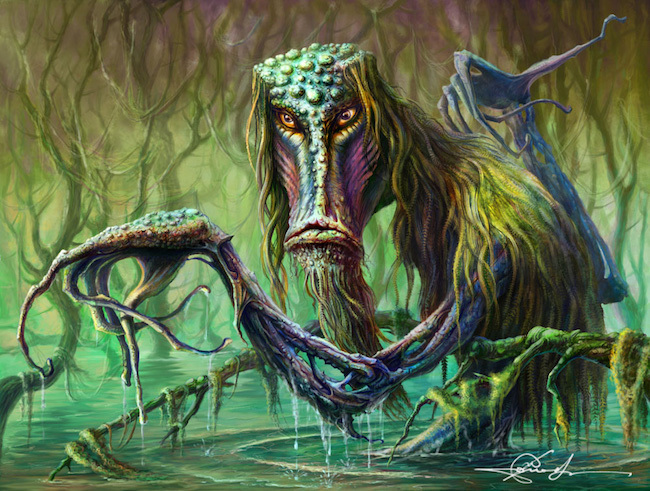 Usually only seen at night, the Vodyanoi has aquatic physical features such as webbed fingers and slimy black scales, but with a humanoid face and piercing, flame-colored eyes. The surest way to anger the Vodyanoi is to upset the natural balance of his watery habitat. For this reason he is known for destroying mills and dams, and for either drowning local villagers or pulling them down to dwell in his home as his household slaves forever after. It is for this reason he is usually blamed for drowning deaths in which no corpse has been found—though if a body does wash up on shore, it is said the the Vodyanoi has kept only the soul in slavery and let the body go. Some local legends maintain that for every new watermill built, the Vodyanoi takes a human life. As a defense against the Vodyanoi, Slavic millers and fisherfolk may attempt to bribe or appease “Grandfather” Vodyanoi with offerings of vodka, tobacco, salt or bread. A chicken or other animal may be offered as a sacrifice to avoid the taking of a life by the Vodyanoi when a new dam or mill is built. 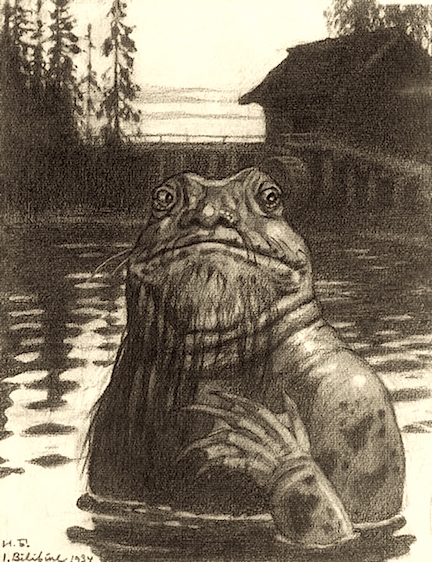 Although the Vodyanoi is frequently antagonistic, he may sometimes choose to protect swimmers or grant good catches to fisherfolk if proper tokens of respect are offered and no harm is done to his realm. Every mill is supposed to have a Yodyany attached to it, or several if it has more wheels than one. Consequently millers are generally obliged to be well-versed in the black art, for if they do not understand how to treat the water-spirits all will go ill with them. The Vodyanoi are a species of amphibious creatures in the Bas-Lag series of steampunk fantasy novels by British author China Miéville, including the 2001 Arthur C. Clarke Award-winning Perdido Street Station. The Witcher—both the series of novels by Polish author Andrzej Sapkowski and the equally popular video game series based on the books—features a vengeful aquatic race called the Vodyanoi, or the fishpeople. The Vodyanoi makes an appearance in the 1979 Russian musical children’s cartoon “The Flying Ship,” as does the Baba Yaga and other characters from Russian skazki. Although the Vodyanoi sleeps through the frozen winter, he awakens hungry and in a bad mood in the early spring. 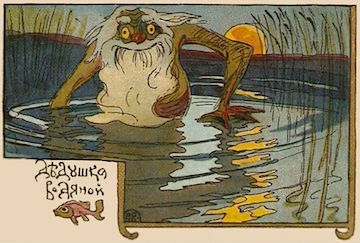 If one finds oneself around millstreams and ponds in Eastern Europe that time of year, avoid swimming after dark or on holy days, and best come prepared with an offering for the cranky local Vodyanoi, lest he drag you away to his pond-bottom castle to eternally do his fishy bidding.